A bomb attack in Iraq has badly damaged one of the holiest sites in Shia Islam, sparking furious protests. 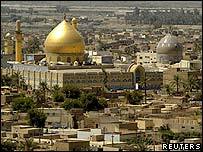 Thousands of Iraqis have gathered at the al-Askari shrine in Samarra, north of Baghdad, where two men blew up the famous golden dome in a dawn raid. Grand Ayatollah Ali al-Sistani, the spiritual head of Iraq's Shia Muslims, has called for a week of mourning. Shias in Baghdad attacked at least five Sunni mosques in reprisal raids, with disturbances reported in other cities. The BBC's Jon Brain in Baghdad says the attack was almost certainly designed to raise the existing tensions between the majority Shia and minority Sunni populations. The shrine is one of two tombs in Samarra for revered Shia imams, which attract pilgrims from around the world. It was attacked one day after at least 22 people died when a car bomb exploded in a market in a Shia neighbourhood of southern Baghdad. There were no immediate reports of injuries in Wednesday's attack, but there are fears that people may have been trapped in the rubble. Large crowds quickly gathered outside the shrine to vent their anger. Angry crowds also gathered in Baghdad, while many in the Shia holy city of Najaf called for revenge. There were reports of disturbances in the Shia-dominated city of Karbala and in the southern city of Basra. However, Ayatollah Sistani, who has consistently preached a moderate tone throughout the Iraqi conflict, urged Shias not to attack Sunni Muslims or their holy places. Firebrand Shia cleric Moqtada al-Sadr cut short a visit to Lebanon on hearing news of the attack. Speaking in London, UK Foreign Secretary Jack Straw called the attack a "criminal and sacrilegious act", but urged all Iraqis to show restraint and avoid retaliation. Samarra is mainly a Sunni Muslim stronghold and has been a focus of the armed insurgency against US troops and the Shia-dominated Iraqi administration. The al-Askari shrine, part of the Imam Ali al-Hadi mausoleum, is one of Shia Islam's holiest sites. The compound contains the remains of the 10th and 11th imams, reputed to be direct descendants of the Prophet Muhammad. Imam Ali al-Hadi died in 868 AD and his son, Hassan al-Askari, died in 874 AD. The golden dome topping the al-Askari shrine was finally completed in 1905. The spiral minaret on top of one of the city's other holy sites, the Sunni Great Mosque of Samarra, was damaged in April 2003. Iraq's Prime Minister Ibrahim Jaafari, a Shia, appeared live on television to declare three days of mourning. He called on Iraqis to "close the road to those who want to undermine national unity". National security adviser Muwafaq al-Rubaie, another Shia, blamed Sunni Muslim militants for the attack. "They will fail to draw the Iraqi people into civil war as they have failed in the past," Reuters news agency reported him saying.